Meditation training has been shown to improve health and well-being. It has also been found to be effective for a large array of medical and psychiatric conditions, either stand-alone or in combination with more traditional therapies. As a result, meditation training has been called the third wave of therapies. But, meditation can be challenging to learn and many people become discouraged and drop the practice. But, modern neuroscience has developed a tool called neurofeedback that can assist the meditator in improving the meditative experience. In today’s Research News article “Source-space EEG neurofeedback links subjective experience with brain activity during effortless awareness meditation.” (See summary below or view the full text of the study at: https://www.ncbi.nlm.nih.gov/pmc/articles/PMC5001938/ ), Lutterveld and colleagues recruited novice and experienced (> 5 years) meditators. Novice meditators were taught to bring about a meditative state of effortless that consists of “concentration”, “observing sensory experience”, “not ‘efforting’“ and “contentment”. Experienced meditators were simply instructed to enter a state of effortless awareness. 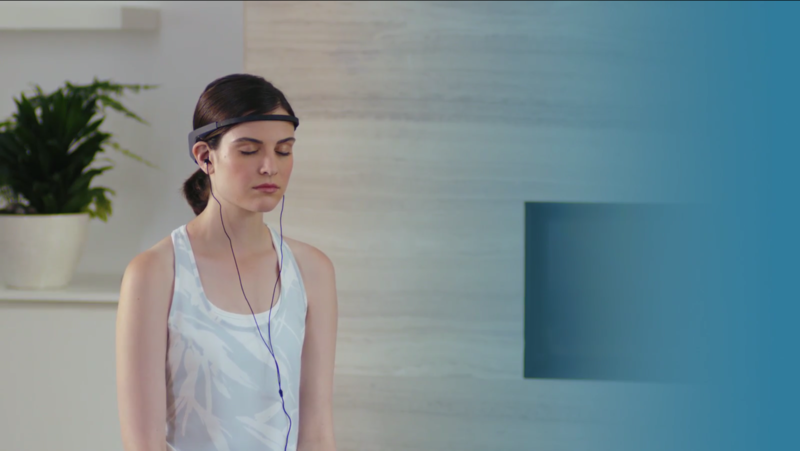 During the meditation the EEG was recorded and the activity of the brain waves in the gamma region (40-57 Hz) from the Posterior Cingulate Cortex (PCC) were recorded. The amount of activity was fed back to the participant in the form of a bar on a monitor screen the increased in size as the amount of activity increased. They found that both groups reported that when they were experiencing effortless awareness the PCC Gamma activity was low. In addition, both groups were able to decrease the PCC Gamma activity when they tried. These results suggest that neurofeedback can be used to alter brain activity in targeted areas and frequency ranges. The Posterior Cingulate Cortex (PCC) is known to be a key structure in what is termed the default mode network. This network becomes active during times when the mind is wandering or in self-referential thought. So, the lowering of PCC Gamma activity with neurofeedback would suggest that the meditators are able to volitionally control mind wandering when appropriate feedback is available. 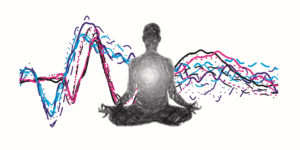 Since PCC Gamma activity is associated with effortless awareness these results suggest that neurofeedback can be used to train individuals to increase the amount of effortless awareness present in their meditation and decrease the amount of mind wandering. This in turn could markedly increase the quality of the meditation practice. Future research should explore the application of this neurofeedback for the improvement of meditation practice and its associated benefits. So, improve effortless awareness meditation with EEG neurofeedback. Meditation is increasingly showing beneficial effects for psychiatric disorders. However, learning to meditate is not straightforward as there are no easily discernible outward signs of performance and thus no direct feedback is possible. As meditation has been found to correlate with posterior cingulate cortex (PCC) activity, we tested whether source-space EEG neurofeedback from the PCC followed the subjective experience of effortless awareness (a major component of meditation), and whether participants could volitionally control the signal. Sixteen novice meditators and sixteen experienced meditators participated in the study. Novice meditators were briefly trained to perform a basic meditation practice to induce the subjective experience of effortless awareness in a progressively more challenging neurofeedback test-battery. Experienced meditators performed a self-selected meditation practice to induce this state in the same test-battery. Neurofeedback was provided based on gamma-band (40–57 Hz) PCC activity extracted using a beamformer algorithm. Associations between PCC activity and the subjective experience of effortless awareness were assessed by verbal probes. Both groups reported that decreased PCC activity corresponded with effortless awareness (P<0.0025 for each group), with high median confidence ratings (novices: 8 on a 0–10 Likert scale; experienced: 9). Both groups showed high moment-to-moment median correspondence ratings between PCC activity and subjective experience of effortless awareness (novices: 8, experienced: 9). Both groups were able to volitionally control the PCC signal in the direction associated with effortless awareness by practicing effortless awareness meditation (novices: median % of time =77.97, P=0.001; experienced: 89.83, P<0.0005). These findings support the feasibility of using EEG neurofeedback to link an objective measure of brain activity with the subjective experience of effortless awareness, and suggest potential utility of this paradigm as a tool for meditation training. Tai Chi has been practiced for thousands of years with benefits for health and longevity. Tai Chi training is designed to enhance function and regulate the activities of the body through regulated breathing, mindful concentration, and gentle movements. Only recently though have the effects of Tai Chi practice been scrutinized with empirical research. But, it has been found to be effective for an array of physical and psychological issues. It appears to strengthen the immune system, reduce inflammation, increase the number of cancer killing cells in the bloodstream and improve cardiovascular function. Tai Chi has also been shown to help the elderly improve attention, balance, reducing falls, arthritis, cognitive function, memory, and reduce age related deterioration of the brain. Because Tai Chi is not strenuous, involving slow gentle movements, and is safe, having no appreciable side effects, it is appropriate for all ages including the elderly and for individuals with illnesses that limit their activities or range of motion. So, with indications of so many benefits it makes sense to explore further the effects of Tai Chi training on physical and psychological well-being. One way to do this is to look at the short-term acute effects of Tai Chi training on practitioners. 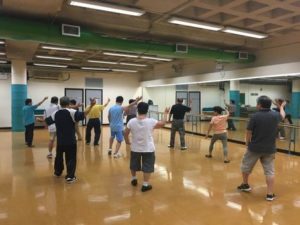 In today’s Research News article “Acute Effects of Tai Chi Training on Cognitive and Cardiovascular Responses in Late Middle-Aged Adults: A Pilot Study.” (See summary below or view the full text of the study at: https://www.ncbi.nlm.nih.gov/pmc/articles/PMC5831874/ ), Cheung and colleagues recruited healthy older adults, aged 50 to 65 years, who had either at least 1 year of Tai Chi practice or no Tai Chi practice. The Tai Chi practitioners were asked to practice for 10 minutes while the non-practitioners were asked to stand quietly. For 1 minute before and after the 10-minute practice period they were measured for heart rate, oxygen saturation in the blood, perceived stress and palmar skin temperature. The Electroencephalogram (EEG) from the frontal cortex was measured and used to gauge attention and meditation levels. They found that prior to the Tai Chi practice the EEG-derived attention level significantly increased but fell during and after the practice in the practitioners but not the control group. After practice the perceived stress level was significantly lower, 44%, and the heart rate was significantly lower in the practitioners relative to the control group. These results suggest that the very short-term effects of Tai Chi practice in experienced practitioners are to increase attention and lower perceived stress and heart rate. This suggests that the immediate effects of Tai Chi practice are to improve the psychological and physiological states of the practitioners. Compounded over time these effects may be responsible for the great health benefits of Tai Chi practice. So, improve cardiovascular and cognitive function with Tai Chi. This study explored the immediate effects of Tai Chi (TC) training on attention and meditation, perceived stress level, heart rate, oxygen saturation level in blood, and palmar skin temperature in late middle-aged adults. Twenty TC practitioners and 20 nonpractitioners volunteered to join the study. After baseline measurements were taken, the TC group performed TC for 10 minutes while their cognitive states and cardiovascular responses were concurrently monitored. The control group rested for the same duration in a standing position. Both groups were then reassessed. The participants’ attention and meditation levels were measured using electroencephalography; stress levels were measured using Perceived Stress Scale; heart rate and blood oxygenation were measured using an oximeter; and palmar skin temperature was measured using an infrared thermometer. Attention level tended to increase during TC and dropped immediately thereafter (p < 0.001). Perceived stress level decreased from baseline to posttest in exclusively the TC group (p = 0.005). Heart rate increased during TC (p < 0.001) and decreased thereafter (p = 0.001). No significant group, time, or group-by-time interaction effects were found in the meditation level, palmar skin temperature, and blood oxygenation outcomes. While a 10-minute TC training could temporarily improve attention and decrease perceived stress levels, it could not improve meditation, palmar skin temperature, or blood oxygenation among late middle-aged adults. Every year, more than 795,000 people in the United States have a stroke and it is the third leading cause of death, killing around 140,000 Americans each year. A stroke results from an interruption of the blood supply to the brain, depriving it of needed oxygen and nutrients. This can result in the death of brain cells and depending on the extent of the damage produce profound loss of function. There are a number of risk factors for stroke that are unchangeable, such as family history, age, and genes. But there are a very large number of factors that are under our control including high blood pressure, smoking, high cholesterol, poor diet, sedentariness, and obesity. Given this list it is clear that basic physical fitness and exercise would be excellent for stroke prevention. Yoga practice is an exercise that can be adapted to the needs and limitations of stroke victims. 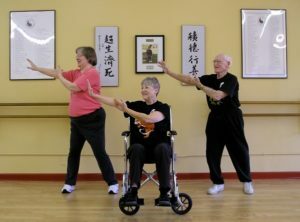 The ancient mindful movement technique Tai Chi and Qigong are very safe forms of gentle exercise that appears to be beneficial for stroke victims. It is difficult to get stroke survivors to engage in exercise. Perhaps the practices of yoga or Tai Chi and Qigong, since they are adaptable and very gentle, might be acceptable and effective in the treatment of stroke survivors. In today’s Research News article “Effects of Mind–Body Movements on Balance Function in Stroke Survivors: A Meta-Analysis of Randomized Controlled Trials.” (See summary below or view the full text of the study at: https://www.ncbi.nlm.nih.gov/pmc/articles/PMC6025433/ ), Zou and colleagues review, summarize, and perform a meta-analysis of the published research literature on the effectiveness of the mindful movement practices of yoga or Tai Chi and Qigong for assisting in the rehabilitation of stroke victims. They found 18 published randomized controlled studies. They found that mindful movement practices produced strong and significant improvements in balance of the patients recovering from stroke. This is particularly important as problems with balance can lead to falling which is a leading cause of injury and death among stroke victims. So, improved balance is an important benefit to the patients. These results are encouraging and suggest that the mindful movement practices of yoga or Tai Chi and Qigong should be used in the rehabilitation or stroke victims. 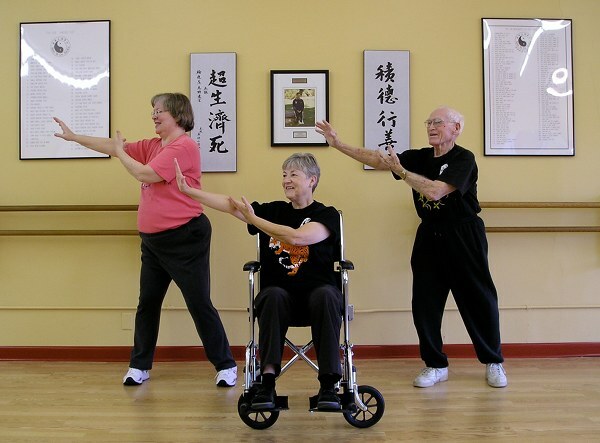 So, improve balance in stroke survivors with yoga, tai chi or qigong. Objective: We performed a systematic review with meta-analysis and meta-regression to determine if mind–body movements (MBM) could be effective in rehabilitating balance function among stroke survivors. Methods: A literature search was conducted using major Chinese and English electronic databases from an inception until January 2018. Randomized controlled studies were included in our meta-analysis. Data was independently extracted by two review authors using a pre-developed table and confirmed by a third party to reach a consensus. Pooled effect size (Hedge’s g) was computed while the random-effect model was set. Results: The meta-analytic results showed a significant benefit of the MBM intervention on increased balance function compared to the control groups (Hedge’s g = 1.59, CI 0.98 to 2.19, p < 0.001, I2 = 94.95%). Additionally, the meta-regression indicated that the total number of sessions (β = 0.00142, 95% CI 0.0039 to 0.0244, p = 0.0067) and dose of weekly training (β = 0.00776, 95% CI0.00579 to 0.00972, p = 0.00) had significantly positive effects on balance function. Conclusions: The study encouraging findings indicate the rehabilitative effect of a MBM intervention for balance function in stroke survivors. However, there were significant limitations in the design among several of the included trials. Additional studies with more robust methodologies are needed to provide a more definitive conclusion. “Meditation leads to concentration, concentration leads to understanding, and understanding leads to happiness” – This wonderful quote from the modern day sage Thich Nhat Hahn is a beautiful pithy description of the benefits of mindfulness practice. Mindfulness allows us to view our experience and not put labels on it, not make assumptions about it, not relate it to past experiences, and not project it into the future. Rather mindfulness lets us experience everything around and within us exactly as it is arising and falling away from moment to moment. A variety of forms of mindfulness training have been shown to increase psychological well-being and happiness. So, it would be expected that yoga practice would similarly increase these positive states. It is not known, however, if yoga training can produce a cross-training effects, improving the effectiveness of other mindfulness practices. In today’s Research News article “Effects of Maharishi Yoga Asanas on Mood States, Happiness, and Experiences during Meditation. International Journal of Yoga.” (See summary below or view the full text of the study at: https://www.ncbi.nlm.nih.gov/pmc/articles/PMC5769201/ ), Gobec and colleagues recruited college students who practiced Transcendental Meditation. They were provided a 2-week course in yoga that met for 2 hours on 8 days over 2 weeks and included instruction in theory and practice of postures. The participants were measured before and after the training for mood states and resilience. They found that after training there was a significant decrease in total disturbance of their mood states. In a second experiment the yoga training occurred for 4 weeks and a matched group of control participants was included. The participants were measured before and after the training for mood states and meditative experiences including: hindrances, relaxation, personal self, transpersonal qualities, and transpersonal self. They found that in comparison to the control participants after yoga training there were significant increases in happiness and meditative experiences, including personal self, transpersonal qualities, and transpersonal self. The results suggest that yoga practice improves mood particularly increasing happiness as has been found to be true for contemplative practices in general. In addition, the results suggest that yoga practice alters the experiences that occur during meditation, including increased ability to transcend experiences of body and mind during meditation. This should greatly enhance the depth and effectiveness of the meditation. This is a completely new finding that yoga practice can enhance the individual’s experience during a separate mindfulness practice, meditation. This “cross-training” effect may greatly increase the effects of yoga practice on the psychological and spiritual health of the individual. So, improve happiness and meditative experiences with yoga. Many studies showed positive effects of Yoga Asanas. There is no study on Maharishi Yoga Asanas yet. This research replicated and expanded observed improvements on the profile of mood states (POMS) as a result of 2-week Maharishi Yoga Asanas course. Thirteen college students taking part in a 4-week course on Maharishi Yoga Asanas were matched with 13 students taking other courses at the university. The main objective of the study was to assess the effects of Maharishi Yoga Asanas on mood states, degree of happiness, and experiences in Transcendental Meditation (TM) practice. All students were given two psychological tests and additional question before and after their 4-https://www.ncbi.nlm.nih.gov/pmc/articles/PMC5769201/happiness. Repeated measure MANOVA showed the 4-week Maharishi Yoga Asanas course resulted in significant increase in happiness during the day and significant improvements in (1) sense of personal self, (2) transpersonal qualities, and (3) transpersonal self during their TM practice. This research shows that Maharishi Yoga Asanas affect more than body and mind. Rather they influence much deeper levels of one’s subjectivity including one’s transpersonal self. Income is only weakly related to happiness, satisfaction with life, and psychological well-being. Indeed, studies of happiness have shown that people with very low incomes are generally unhappy. 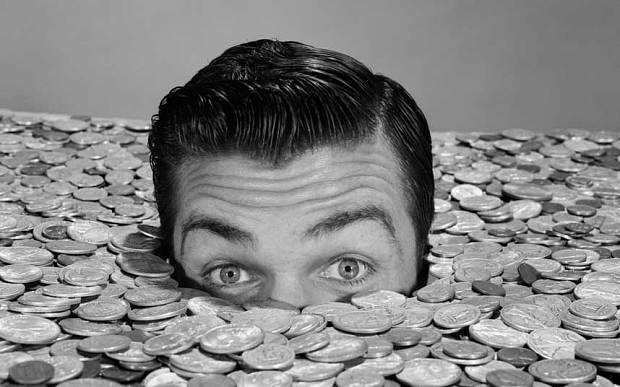 Surprising, those who are quite rich tend to be generally unhappy. It’s the people in the middle, with sufficient, but not excessive income, who are generally the happiest. A surprising fact in this regard is that people who have won large amounts of money in the lottery afterward are much less happy than before. In the U.S. as individual incomes rose over decades the percent of people considering themselves very happy fell and depression rose. Indeed, higher incomes are associated with higher levels of stress, increased likelihood of divorce, and less enjoyment of small activities. It is possible that a higher income may mean more work, less leisure time, and fewer strong social connections. In other words, the benefits of having more money might be offset by the sacrifices people are making in other aspects of wellbeing. Mindfulness has been found to be associated with happiness and well-being. It is possible that mindfulness may affect the relationship between income and happiness, satisfaction with life, and psychological well-being. In today’s Research News article “Mindfulness as a Moderator in the Relation Between Income and Psychological Well-Being.” (See summary below or view the full text of the study at: https://www.ncbi.nlm.nih.gov/pmc/articles/PMC6099076/ ), Sugiura and colleagues recruited adult participants (aged 20 to 59 years) on-line and measured their income levels, mindfulness, satisfaction with life, and psychological well-being, including subscales for self-acceptance, environmental mastery, positive relations with others, personal growth, purpose in life, and autonomy. They found, similar to previous research, that income had a significant but very small positive relationship with satisfaction with life and psychological well-being. Interestingly, income was also significantly positively related to the mindfulness facet of non-reacting and negatively with the observing facet. They found further that the association of income with psychological well-being with life was moderated by the non-judging and describing facets of mindfulness such that when these facets were high psychological well-being was high irrespective of income but when they were low income had a strong positive association with psychological well-being. So, improve psychological well-being regardless of income with Mindfulness. The relation between income and life satisfaction has been found to be weak, albeit positive (r = 0.10–0.20). This study introduced psychological well-being (PWB) as a dependent variable predicted by income in addition to life satisfaction. Furthermore, individual differences might determine the strength of this relation, that is, act as moderators. Thus, this study introduced mindfulness as one such possible moderator. Participants (N = 800, 50% women, aged 20–59 years) completed an Internet questionnaire. Of them, 734 reported income and were included in the analyses. Income had weak, yet positive, zero-order correlations with life satisfaction and PWB (r = 0.13 and 0.11). Hierarchical regression controlling for demographics indicated that the relation between income and PWB was moderated by mindfulness facets. Specifically, among those low in not judging or describing of experiences, PWB was positively related to income. On the other hand, those high in these mindfulness dimensions indicated higher PWB irrespective of income. Work is very important for our health and well-being. We spend approximately 25% of our adult lives at work. How we spend that time is immensely important for our psychological and physical health. Indeed, the work environment has even become an important part of our social lives, with friendships and leisure time activities often attached to the people we work with. But, more than half of employees in the U.S. and nearly 2/3 worldwide are unhappy at work. This is partially due to work-related stress which is epidemic in the western workplace. Almost two thirds of workers reporting high levels of stress at work. This stress can result in impaired health and can result in burnout; producing fatigue, cynicism, and professional inefficacy. 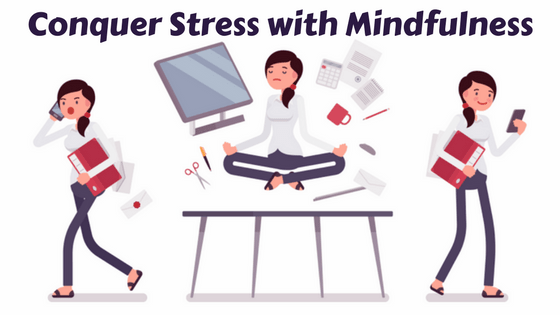 To help overcome unhappiness, stress, and burnout, mindfulness practices have been implemented in the workplace. Indeed, mindfulness practices have been shown to markedly reduce the physiological and psychological responses to stress. 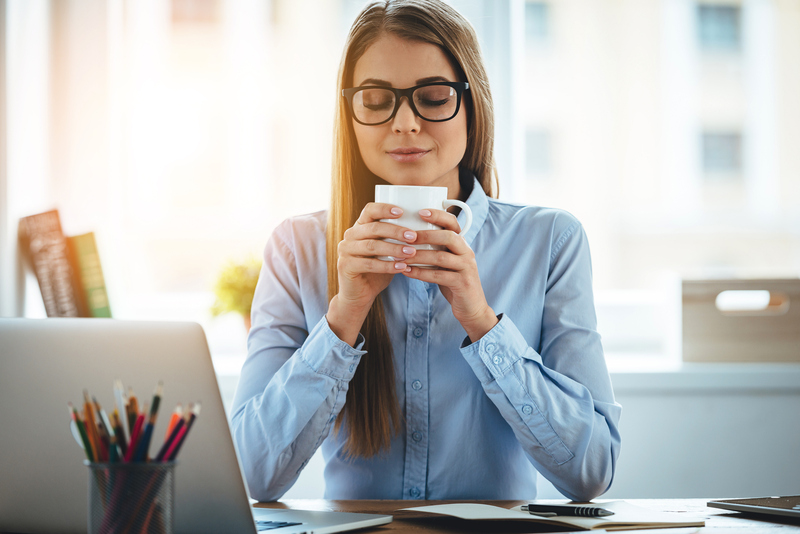 As a result, it has become very trendy for business to incorporate meditation into the workday to help improve employee well-being, health, and productivity. These programs attempt to increase the employees’ mindfulness at work and thereby reduce stress and burnout. In today’s Research News article “A mindfulness training program based on brief practices (M-PBI) to reduce stress in the workplace: a randomised controlled pilot study.” (See summary below or view the full text of the study at: https://www.ncbi.nlm.nih.gov/pmc/articles/PMC6060839/ ), Arredondo and colleagues recruited stressed employees and randomly assigned them to either be in a wait-list control group or to receive an 8-week mindfulness training program. The training occurred once a week for 1.5 hours and included daily practices. The participants were measured before and after training and 20 weeks later for mindfulness, perceived stress, self-compassion, decentering, burnout, and heart rate variability. They found that in comparison to baseline and the wait-list control group the mindfulness trained group had significant decreases in perceived stress and the components of burnout of emotional exhaustion, depersonalization, and reduced personal accomplishment, and significant increases in mindfulness, self-compassion, and decentering. These differences were enduring as they were still significant at the 20-week follow-up. They also found an increase in heart rate variability indicative of reduced stress. These results are very encouraging and suggest that mindfulness training can be very beneficial in reducing workplace stress levels and burnout. It also appears to improve the overall psychological well-being of the employees improving mindfulness, self-compassion, and decentering. The ability of mindfulness training to reduce stress and burnout, and to increase self-compassion and decentering have been previously observed with different participant population. The study would have been stronger had an active control group been included. But, nevertheless the findings are suggestive that mindfulness training can be quite beneficial for stressed employees. So, reduce stress and improve well-being in a workplace with mindfulness. Work stress is a major contributor to absenteeism and reduced work productivity. A randomised and controlled study in employee-volunteers (with Perceived Stress Scale [PSS-14]>22) was performed to assess a mindfulness program based on brief integrated mindfulness practices (M-PBI) with the aim of reducing stress in the workplace. The PSS-14 of the employees before and after 8-weeks M-PBI program, as well as after a 20-week follow-up, was assessed (primary endpoint). The employees also carried the following questionnaires (secondary endpoints): Five Facet Mindfulness Questionnaire (FFMQ), Self-Compassion Scale (SCS), Experiences Questionnaire-Decentering (EQ-D), and Maslach Burnout Inventory-General Survey (MBI-GS). Heart Rate Variability (HRV) was measured during each session in a subgroup of employees (n = 10) of the interventional group randomly selected. A total of 40 employees (77.5% female median [SD] age of 36.6 [5.6] years) took part in this study: 21 and 19 in the intervention and control group, respectively. No differences in baseline characteristics were encountered between the groups. Results show a significant decrease in stress and increase in mindfulness over time in the intervention group (PSS-14 and FFMQ; p < 0.05 both). Additionally, an improvement in decentering (EQ-D), self-compassion (SCS) and burnout (MBI-GS) were also observed compared to the control group (p < 0.05 in all). HRV measurement also showed an improvement. In conclusion, a brief practices, 8-weeks M-BIP program is an effective tool to quickly reduce stress and improve well-being in a workplace. Low Back Pain is the leading cause of disability worldwide and affects between 6% to 15% of the population. It is estimated, however, that 80% of the population will experience back pain sometime during their lives. The pain interferes with daily living and with work, interfering with productivity and creating absences. There are varied treatments for low back pain including chiropractic care, acupuncture, biofeedback, physical therapy, cognitive behavioral therapy, massage, surgery, opiate pain killing drugs, steroid injections, and muscle relaxant drugs. These therapies are sometimes effective particularly for acute back pain. But, for chronic conditions the treatments are less effective and often require continuing treatment for years and opiate pain killers are dangerous and can lead to abuse, addiction, and fatal overdoses. Obviously, there is a need for safe and effective treatments for low back pain that are low cost and don’t have troublesome side effects. Pain involves both physical and psychological issues. Physically, exercise can be helpful in strengthening the back to prevent or relieve pain. Psychologically, the stress, fear, and anxiety produced by pain tends to elicit responses that actually amplify the pain. So, reducing the emotional reactions to pain may be helpful in pain management. Mindfulness practices have been shown to improve emotion regulation producing more adaptive and less maladaptive responses to emotions. Indeed, mindfulness practices are effective in treating pain and have been shown to be safe and effective in the management of low back pain. There is a need to explore the utility of mindfulness training when it is used as a supplement to opioid treatment for chronic low back pain. In today’s Research News article “Cost of Opioid-Treated Chronic Low Back Pain: Findings from a Pilot Randomized Controlled Trial of Mindfulness Meditation-Based Intervention.” (See summary below or view the full text of the study at: https://www.ncbi.nlm.nih.gov/pmc/articles/PMC5836724/ ), Zgierska and colleagues recruited adults with chronic low back pain and were being treated with opioids. They were randomly assigned to either continue with only treatment as usual or receive additional mindfulness training delivered in 8-weekly 2-hour sessions with home practice. They were measured before and after training for pain severity, pain responses to heat, healthcare utilization, productivity loss, medication use, and costs associated with disability and treatment. They found that in comparison to baseline and the treatment as usual control, the patients that received mindfulness training had significantly reduced pain severity and pain response to heat. In addition, the mindfulness group tended to have fewer lost days of work while the control group tended to use more opioid medication. In looking at the economic costs of opioid treatment for low back pain, they found that adding the mindfulness training did not increase overall costs. Hence, mindfulness training appears to additionally relieve chronic low back pain beyond the effects of opioid medication, yet does not cost any more. So, improve opioid-treated chronic low back pain with mindfulness. Opioid-treated chronic low back pain (CLBP) is debilitating, costly and often refractory to existing treatments. This secondary analysis aims to pilot-test the hypothesis that mindfulness meditation (MM) can reduce economic burden related to opioid-treated CLBP. 26-week unblinded pilot randomized controlled trial, comparing MM, adjunctive to usual-care, to usual care alone. Thirty-five adults with opioid-treated CLBP (≥ 30 morphine-equivalent mg/day) for 3+ months enrolled; none withdrew. 8 weekly therapist-led MM sessions and at-home practice. Costs related to self-reported healthcare utilization, medication use (direct costs), lost productivity (indirect costs), and total costs (direct+indirect costs) were calculated for 6-month pre- and post-enrollment periods and compared within and between the groups. Participants (21 MM; 14 control) were 20% men, age 51.8 ± 9.7 years, with severe disability, opioid dose of 148.3 ± 129.2 morphine-equivalent mg/day, and individual annual income of $18,291 ± $19,345. At baseline, total costs were estimated at $15,497 ± 13,677 (direct: $10,635 ± 9,897; indirect: $4,862 ± 7,298) per participant. Although MM group participants, compared to controls, reduced their pain severity ratings and pain sensitivity to heat-stimuli (p<0.05), no statistically significant within-group changes or between-group differences in direct and indirect costs were noted. Adults with opioid-treated CLBP experience a high burden of disability despite the high costs of treatment. Although this pilot study did not show a statistically significant impact of MM on costs related to opioid-treated CLBP, MM can improve clinical outcomes and should be assessed in a larger trial with long-term follow-up. One of the primary effects of mindfulness training is an improvement in the ability to pay attention to the task at hand and ignore interfering stimuli. This is an important consequence of mindfulness training and produces improvements in thinking, reasoning, and creativity. The importance of heightened attentional ability to the individual’s ability to navigate the demands of complex modern life cannot be overstated. It helps at work, in relationships, or simply driving a car. There is evidence that mindfulness training improves attention by altering the brain. It appears That mindfulness training increases the size, connectivity, and activity of areas of the brain that are involved in paying attention. A common method to study the activity of the nervous system is to measure the electrical signal at the scalp above brain regions. Changes in this activity are measurable with mindfulness training. One method to observe attentional processing in the brain is to measure the changes in the electrical activity that occur in response to specific stimuli. These are called event-related potentials or ERPs. The signal following a stimulus changes over time. The fluctuations of the signal after specific periods of time are thought to measure different aspects of the nervous system’s processing of the stimulus. The P3b response in the evoked potential (ERP) is a positive going electrical response occurring between a 2.5 to 5 tenths of a second following the target stimulus presentation. The P3b (distractor positivity) component is thought to reflect an attentional suppression process involved in preventing shifts in attention. The N2 response is a negative electrical change that occurs around 2 tenths of a second following the target stimulus presentation. The N2 response has been implicated in conflict detection and executive attention. These components of the evoked potential can be used to assess the nature of attentional processing before and after meditation, reflecting how meditation might improve attention. In today’s Research News article “Brief Mindfulness Meditation Improves Attention in Novices: Evidence From ERPs and Moderation by Neuroticism.” (See summary below or view the full text of the study at: https://www.ncbi.nlm.nih.gov/pmc/articles/PMC6088366/ ), Norris and colleagues recruited undergraduate students for two experiments to examine the ability of a very brief meditation experience to affect attentional abilities. In the first study they had the students listen to a 10-minute recording either of mindfulness meditation instructions or a reading of a National Geographic article about giant sequoias. The participants then performed a flanker task, a measure of executive cognitive function. In this task the participant has to respond to the direction of an arrow, when it is surrounded by distracting arrows that point either in the same (congruent) or opposite (incongruent) directions. Afterwards they completed the Big 5 Personality Inventory. They found that the participants who listened to the meditation recording were significantly more accurate on the flanker task on incongruent trials. This suggests that a brief meditation improves cognitive attentional ability to screen out irrelevant material. In the second study students listened to recordings like in study 1 and performed an attention network task. It includes the flanker task but also includes measures of different types of attention, including alerting, orienting, and executive control. While performing the task the electroencephalogram (EEG) was recorded and the event related potential recorded in response to the presentation of the task. They found that the participants who listened to the meditation recording were significantly faster in responding on the attentional network task. They found that the low neuroticism participants who listened to the meditation recording had significantly larger N2 ERP responses and significantly smaller P3b ERP responses during incongruent (conflict) task than controls. These changes in the ERP suggests that after meditation, the brain functions better in allocating attentional resources to the task at hand. These results are interesting and suggest that even a single brief meditation experience can alter both behavioral and EEG measures of attention. They suggest that even a 10-minute meditation enhances attentional mechanisms. This extends the literature on the effectiveness of mindfulness training on attention, demonstrating that even 10 minutes of meditation exposure can improve the individual’s ability to attend to and process information in the present environment. So, improve attention with even very brief meditation. Past research has found that mindfulness meditation training improves executive attention. Event-related potentials (ERPs) have indicated that this effect could be driven by more efficient allocation of resources on demanding attentional tasks, such as the Flanker Task and the Attention Network Test (ANT). However, it is not clear whether these changes depend on long-term practice. In two studies, we sought to investigate the effects of a brief, 10-min meditation session on attention in novice meditators, compared to a control activity. We also tested moderation by individual differences in neuroticism and the possible underlying neural mechanisms driving these effects, using ERPs. In Study 1, participants randomly assigned to listen to a 10-min meditation tape had better accuracy on incongruent trials on a Flanker task, with no detriment in reaction times (RTs), indicating better allocation of resources. In Study 2, those assigned to listen to a meditation tape performed an ANT more quickly than control participants, with no detriment in performance. Neuroticism moderated both of these effects, and ERPs showed that those individuals lower in neuroticism who meditated for 10 min exhibited a larger N2 to incongruent trials compared to those who listened to a control tape; whereas those individuals higher in neuroticism did not. Together, our results support the hypothesis that even brief meditation improves allocation of attentional resources in some novices. Mindfulness training has been shown to be effective in improving physical and psychological health. One reason for these benefits is that mindfulness training improves the individual’s physical and psychological reactions to stress. Stress is an integral part of life, that is actually essential to the health of the body. In moderation, it is healthful, strengthening, and provides interest and fun to life. If stress, is high or is prolonged, however, it can be problematic. It can significantly damage our physical and mental health and even reduce our longevity, leading to premature deaths. So, it is important that we develop methods to either reduce or control high or prolonged stress or reduce our responses to it. Mindfulness practices have been found routinely to reduce the psychological and physiological responses to stress. The research, however, at times, involves weak research designs and suffers from lack of control for social support and experimenter and participant expectancy effects. In addition, it is not known how mindfulness training influences levels of perceived stress. In today’s Research News article “Investigating the Specific Effects of an Online Mindfulness-Based Self-Help Intervention on Stress and Underlying Mechanisms.” (See summary below or view the full text of the study at: https://www.ncbi.nlm.nih.gov/pmc/articles/PMC6061241/ ), Gu and colleagues examined the effects of mindfulness training on stress levels in a well controlled experimental design. They recruited university students and staff and randomly assigned them to one of three conditions; online Mindfulness-Based Self-Help training, listening to classical music online, or to a wait list. The Mindfulness training occurred over 2 weeks with 4 times per week 10-minute online recordings and home practice. The online listening to classical music conditions paralleled the mindfulness condition in being presented over 2 weeks with 4 times per week 10-minute recorded instructions and home practice. The participants were measured before during and after the training for mindfulness, self-compassion, worry, perceived stress, how engaged was the participant in practice, and participant expectancies. They found that in comparison to before training and the music and wait list conditions, the mindfulness group had significantly lower levels of perceived stress and worry and significantly higher levels of mindfulness and self-compassion. They also performed a mediation analysis to investigate whether the effects of stress may have been mediated by the effects on mindfulness, worry, and or self-compassion. They found that higher mindfulness scores produced by the mindfulness intervention were associated with lower perceived stress. Similarly, lower worry scores produced by the mindfulness intervention were associated with lower perceived stress and higher self-compassion or scores produced by the mindfulness intervention were associated with lower perceived stress. Importantly, there were no significant differences between the conditions in engagement or expectancy effects. These results demonstrate that mindfulness training lowers perceived stress levels and this could not be accounted for by expectancy or engagement effects. 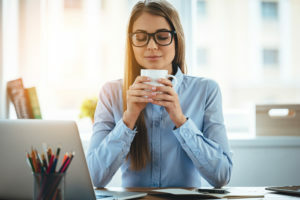 They further demonstrated that a mindfulness intervention lowers perceived stress by increasing mindfulness and self-compassion and lowers worry. Previous research has demonstrated that mindfulness training decreases perceived stress and worry, and increases mindfulness and self-compassion. The contribution of the current study is to demonstrate that the effects were not due to experimental contaminants and that the effects on perceived stress are due to effects on all three of these variables. So, reduce perceived stress with mindfulness. Previous research examining the effects of mindfulness-based interventions (MBIs) and their mechanisms of change has been hampered by failure to control for non-specific factors, such as social support and interaction with group members, facilitator contact and expectation of benefit, meaning that it remained possible that benefits of MBIs could have been attributable, perhaps entirely, to non-specific elements. This experimental study examined the effects of a 2-week online mindfulness-based self-help (MBSH) intervention compared to a well-matched classical music control condition and a waitlist control condition on perceived stress. This study also tested mindfulness, self-compassion and worry as mechanisms of the effects of MBSH versus both control conditions on stress. University students and staff (N = 214) were randomised to MBSH, classical music, or waitlist conditions and completed self-report measures pre-, mid- and post-intervention. Post-intervention, MBSH was found to significantly reduce stress compared to both control conditions. Bootstrapping-based mediation analyses used standardised residualised change scores for all variables, with mediators computed as change from baseline to mid-intervention, and the outcome computed as change from baseline to post-intervention. Changes in mindfulness, self-compassion and worry were found to significantly mediate the effects of MBSH versus both control conditions on changes in stress. Findings suggest that cultivating mindfulness specifically confers benefits to stress and that these benefits may occur through improving theorised mechanisms. Experiencing trauma is quite common. It has been estimated that 60% of men and 50% of women will experience a significant traumatic event during their lifetime. But, only a fraction will develop Post-Traumatic Stress Disorder (PTSD). But this still results in a frightening number of people with 7%-8% of the population developing PTSD at some point in their life. For military personnel, it’s much more likely for PTSD to develop with about 11%-20% of those who have served in a war zone developing PTSD. PTSD involves a number of troubling symptoms including reliving the event with the same fear and horror in nightmares or with a flashback. PTSD sufferers avoid situations that remind them of the event this may include crowds, driving, movies, etc. and may avoid seeking help because it keeps them from having to think or talk about the event. They often experience negative changes in beliefs and feelings including difficulty experiencing positive or loving feelings toward other people, avoiding relationships, memory difficulties, or see the world as dangerous and no one can be trusted. Sufferers may feel hyperarousal, feeling keyed up and jittery, or always alert and on the lookout for danger. They may experience sudden anger or irritability, may have a hard time sleeping or concentrating, may be startled by a loud noise or surprise. Obviously, these are troubling symptoms that need to be addressed. There are a number of therapies that have been developed to treat PTSD. One of which, mindfulness training has been found to be particularly effective. Yoga practice is a mindfulness practice that has been shown to be helpful for PTSD. If the practice was tailored for the patients’ specific traumas and environment perhaps it would be even more effective. In today’s Research News article “Military-Tailored Yoga for Veterans with Post-traumatic Stress Disorder.” (See summary below or view the full text of the study at: https://www.ncbi.nlm.nih.gov/pmc/articles/PMC6086130/ ), Cushing and colleagues examine the effectiveness of a yoga practice that was tailored for military personnel and combat-related PTSD for the relief of PTSD symptoms of military veterans. They recruited veterans of either the Iraq or Afghanistan wars who were diagnosed with Post-Traumatic Stress Disorder (PTSD). They were provided a weekly 60-minute yoga training for 6 weeks. The yoga training consisted of relaxation, postures, and body scan meditation. The participants were measured before and after the 6-week training for PTSD symptoms, anxiety, sleep quality, and mindfulness. They found that after training there was a very large significant reduction in PTSD symptoms, including hyperarousal, re-experiencing, and avoidance symptoms. There were also large significant reductions in sleep disturbance and anxiety and increases in mindfulness. Hence, there were marked improvements in the psychological well-being of the combat veterans following yoga training. The study suffers from the fact that there wasn’t a control, comparison, condition. As a result, the results might have been influenced by participant and experimenter biases. But, the observed changes were large and robust making it unlikely that they were due to contamination. The findings were also in line with previous findings in better controlled trial that mindfulness training is an effective treatment for the symptoms of PTSD. So, reduce symptoms of Post-Traumatic Stress Disorder (PTSD) with yoga. Among veterans of post-9/11 conflicts, estimates of post-traumatic stress disorder (PTSD) range from 9% shortly after returning from deployment to 31% a year after deployment. Clinical and pharmaceutically based treatments are underutilized. This could be due to concerns related to lost duty days, as well as PTSD patients’ fears of stigma of having a mental health condition. Yoga has been shown to reduce PTSD symptoms in the civilian population, but few studies have tested the impact of yoga on veterans of post-9/11 conflicts. The purpose of this study is to test the impact of yoga on post-9/11 veterans diagnosed with PTSD. Participants were 18 yr of age or older and veterans of post-9/11 conflicts. They had subthreshold or diagnostic-level PTSD related to their combat military service, as determined by a score of 30 or higher on the PTSD Checklist-Military version (PCL-M). Veterans participated in 60-min weekly yoga sessions for 6 wk taught by a Warriors at Ease-trained yoga instructor who is a, post-9/11 veteran. The yoga sessions incorporated Vinyasa-style yoga and a trauma-sensitive, military-culture informed approach advocated by two separate organizations: Warriors at Ease and Meghan’s Foundation. Data were collected at baseline and again after 7 wk. The primary outcome was PCL-M score. Participants also completed the Patient Health Questionnaire, the Beck Anxiety Inventory, the Pittsburgh Sleep Quality Index, and the Mindful Attention Awareness Scale at both time points. Eighteen Operation Enduring Freedom, Operation Iraqi Freedom, and Operation New Dawn veterans completed the pre- and post-intervention self-report questionnaires. Age ranged from 26 to 62 yr (median = 43 yr), length of service ranged from 2 to 34 yr (median = 18.8 yr), and 13 (72.2%) had completed college. Decreased PTSD symptomatology was demonstrated in the three-symptom clusters represented in the PCL-M (i.e., hyperarousal, re-experiencing, and avoidance). In addition, the total score on the PCL-M decreased significantly, by both statistical and clinical measures. The participants also demonstrated improved mindfulness scores and reported decreased insomnia, depression, and anxiety symptoms. This study demonstrates that a trauma-sensitive yoga intervention may be effective for veterans with PTSD symptoms, whether as stand-alone or adjunctive therapy. The impressive decrease in PTSD symptomatology may be due to the tailored military-specific nature of this intervention and the fact that it was led by a veteran of post-9/11 conflicts. More research is needed with a larger sample and a more diverse veteran population.